The reorganization continues. The new computer system to manage TKGA member records is wonderful. I think everyone will be very pleased. The last print copy of Cast On went out this week. Apparently some members did not get the email we sent in July announcing the formation of a new organization due to the management company's decision to dissolve TKGA. I spent quite a bit of time answering emails from members who are very unhappy that there will not be a print issue. We don't have a choice unless someone wants to donate $15K or so. The sad truth is some peoples' default mode is to complain and be mad and generally they aren't very nice about it. I am getting a lot of practice in diplomacy. We used to list course completions in the magazine but we will start listing them in newsletter once the transition is complete. I've been receiving lessons this week for review. I've noticed a problem in several of the lessons I reviewed recently--very tight bind offs. When a bind off is too tight, it looks like this. 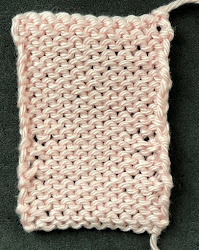 In this swatch the corners can be squared off and the elasticity matches the cast on edge. How this happens is that when you have slipped the first stitch over the stitch just knit, you pull the working yarn too tightly. All this does is pull the yarn from the stitch you just bound off making it very tight. This is an easy problem to solve...just use consistent tension when binding off. Sometimes it is recommended that you use a larger needle. This can help but if you are pulling the working yarn too tightly, it won't make much of a difference. The other problem in the bind off is that the last stitch is oversized. I've seen tons of tips devoted to this topic and most are pretty worthless or cause more issues than they fix. The best solution I've seen for this is from Suzanne Bryan, a former co-chair of the Masters Committee. She is a very analytical knitter. Here is a link to her blog KnittingSuzanne. To summarize the problem is that since there isn't a stitch to the left of the last stitch it can get oversized. If you tighten up that stitch you can solve this problem. Here is the link to my video on how to do this and how to avoid a tight bind off. Ugly Bind Offs. Salon will be on Sunday, September 4th from 1:30-3:20. Hope you can make it! The yarn for the Chevron Shawl arrived yesterday. I love the colors.